Dollar rises broadly in early US session as partly helped by pleasant surprise in initial jobless claims, which fell to lowest since 1969. But gains are so far limited as markets are awaiting meeting between Trump and Chinese Vice Premier Liu He at 2030 GMT. It’s widely reported that solid progress were made in the US-China trade negotiations since the meeting in Beijing last week. And Trump could be ready to finally announce a summit with Chines President Xi Jinping to sign a deal. But still, nothing is done until it’s done. Also, the non-farm payroll report tomorrow will carry much more significance than today’s jobless claims figure. Meanwhile, news out of Europe are generally negative. Germany factory orders contracted sharply by -4.2% mom in March. Germany’s leading economic institutes lowered economic growth forecasts for the country in 2019 sharply to 0.8%, down from 1.9%. Italy is said to revise down growth forecasts to as low as 0.1% in 2019, thus raising budget deficit target to 2.3-2.4%. ECB accounts revealed that some policymakers considered pushing timing of first hike to after Q1 2020. There is no special progress in Brexit in UK even though April 12 cliff edge is approaching. Nevertheless, Euro isn’t too weak at all. Technically, Dollar pairs are back into focus today. EUR/USD might have a take on 1.1176 key support. Decisive break there will resume larger down trend from 1.2555. 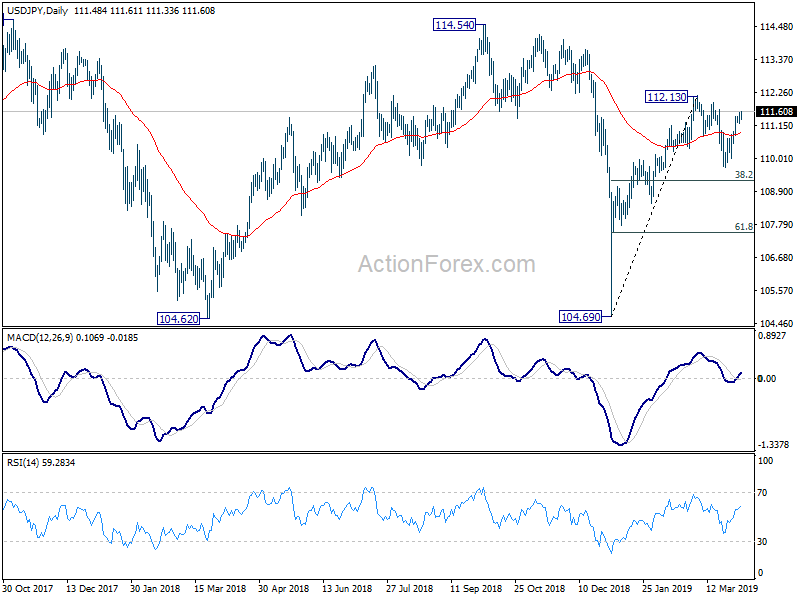 USD/JPY is eying 111.57 temporary top and break will bring a test on 112.31 near term resistance. Sterling continues the pattern of rising in Asian session and weakening into US session. GBP/USD, GBP/JPY and EUR/GBP are still range bound with no sign of breakout. In other markets, DOW opens higher by around 100 pts. In Europe, currently, FTSE is down -0.28%. DAX is up 0.34%. CAC is down -0.12%. Germany 10-year yield is down -0.0133 at -0.003, back in negative territory. Earlier in Asia, Nikkei rose 0.05%. Hong Kong HSI dropped -0.17%. China Shanghai SSE rose 0.94%. Singapore Strait Times rose 0.15%. US initial jobless claims dropped -10k to 202k in the week ending March 30, below expectation of 215k. It’s also the lowest level since December 6, 1969. Four-week moving average of initial claims dropped -4k to 213.5k. Continuing claims dropped -38k to 1.717M in the week ending March 23. Four-week moving average of continuing claims dropped -8k to 1.743M. Challenger job cuts rose 0.4% yoy in March. Trump attacks Fed again, but anyone cares to listen? Trump attacks Fed again by describing Fed’s actions as “unnecessary and destructive” in his tweet. But he also said despite that the economy is looking very strong, with China and USMCA deals “moving along nicely”. The monetary policy meeting accounts of March ECB meeting revealed debates regarding the extent of the extension in the calendar based leg of the forward guidance. Back then, ECB said interest rates will be kept at current level at least through the “end of 2019”, changed from “summer of 2019”. On the economy, the baseline scenario was a more protracted “soft patch” followed by a return to more solid growth. However, “uncertainty remained elevated” and it was “unclear how persistent the current soft patch would turn out to be.” Also “downside risks to the growth outlook continued to prevail despite” despite downward revision in growth forecasts in March. Released from Germany, factory orders dropped sharply by -4.2% mom in February, missed expectation of 0.3% mom rise. It’s widely reported today that Italy is going to cut 2019 growth forecast within this month. The government previously projected 1% growth this year and agreed to 2.04% budget deficit to GDP with EU. Reuters said Italy will lower GDP growth forecast to just 0.3-0.4%. Bloomberg went further and said it could be revised down to just 0.1%. The budget deficit target, could then be raised up to 2.3-2.4% of GDP. The final numbers will be approved by the Cabinet next week. But based on current situation, another clash with EU seems inevitable. European Commission Vice President Jyrki Katainen warned that “hard Brexit is increasingly possible because we don’t know what the alternative is”. USD/JPY’s rally resumes by breaking through 111.57 temporary top, after brief consolidations. Intraday bias is back on the upside for 112.13 resistance. Decisive break of 112.13 resistance will resume whole rise from 104.69 to 114.54 key resistance next. For now, further rally will remain mildly in favor as long as 111.18 minor support holds. But break of 111.18 will turn bias back to the downside for 109.71, and possibly further to 38.2% retracement of 104.69 to 112.13 at 109.28. In the bigger picture, while the rebound from 104.69 was strong, USD/JPY failed to sustain above 55 week EMA (now at 110.80), and was kept well below 114.54 resistance. Medium term outlook is turned mixed and we’ll wait for the structure of the fall from 112.13 to unveil to make an assessment later. 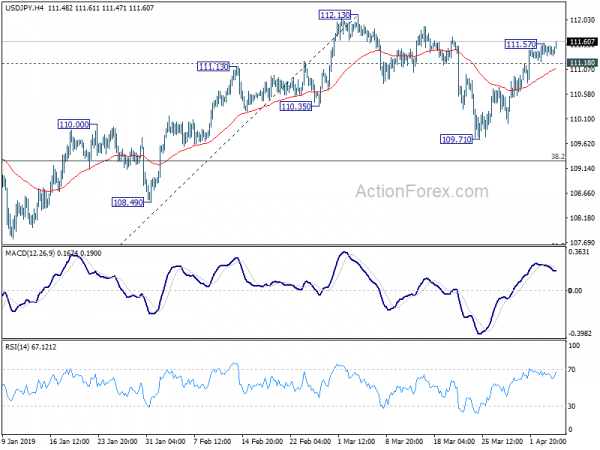 For now, more range trading is expected between 104.69 and 112.13 first.